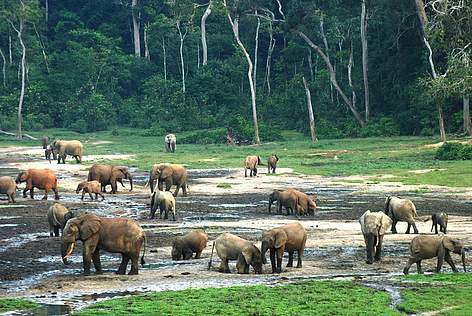 Forest elephants in Dzanga Bai in Central African Republic. Largely untouched, but slowly gnawed away by a growing population and logging interests, the Congo Basin forests form the second largest block of rainforest in the world after the Amazon. These forests are not only an important habitat for elephants and gorillas, but also to indigenous groups that have lived here for thousands of years. They are the breadbasket and home of millions of people, supply game and wood, regulate the local climate and the flow of water, protect and enrich soils, control pests and diseases and safeguard water quality. 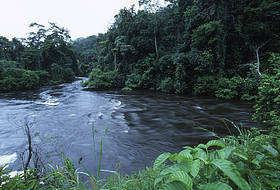 The Congo River Basin covers a massive area concentrated in a narrow band of land that straddles the equator. The basin is drained by the Congo River and covers approximately 3.7 million km2, slightly more than the size of India and France put together. A massive forest expanse of 1.5 million km2 covers the area, spreading across the Democratic Republic of Congo (DRC), most of Congo-Brazzaville, the southeastern reaches of Cameroon, southern Central African Republic (CAR), Gabon and Equatorial Guinea - extending well beyond the actual limits of the Congo River Basin. The forests of the Congo River Basin stretch from the Ruwenzori Range, on the flanks of the Albertine Rift in eastern DRC, to the Atlantic coast of the Gulf of Guinea. The Ruwenzoris reach 3,000 m and the highest points are permanently snow-capped. Smaller mountain ranges are found around the Gulf of Guinea, such as the Monts de Alen and Monts de Cristal. The second largest river in the world in terms of the amount of water it carries, the Congo River drains the basin as it cuts across the region. At the eastern side of the Congo River Basin there are swamps and lakes that play an important role in regulating the flow of the river. The northern forests have a hot, severe dry season, which increases in intensity as one moves away from the equator. The forests of the western parts of the region have a much cooler dry season, with coastal areas subject to tropical monsoon climate conditions, especially in the Gulf of Guinea. Rainfall and temperature patterns in Central Africa vary considerably, with unpredictable seasonal variations. Some of the heaviest rains in the world are experienced at the foot of Mount Cameroon, around 10,000 mm annually. The central part of the Congo River Basin and the foothills of the mountain range that borders the Albertine Rift also receive a lot of rainfall (2,000 – 3,000 mm per year), while the rest of the dense forest gets relatively little (1,500 mm - 1,800 m per year). There is little temperature variation in the lowland coastal forests, mostly because persistent cloud cover keeps mean annual temperatures between 26°C and 28°C. Things are cooler up in the mountains, where mean annual temperatures vary between 19°C and 24°C. What will you encounter in the Congo Basin’s rainforests? These forests are the home of threatened forest elephants and the hideaway of gorillas, chimpanzees, forest elephants and countless other species. Some 400 mammal species, 1,000 bird species and quite likely over 10,000 plant species (of which 3,000 are found nowhere else) are reported to live in the Congo River Basin. Scientists are constantly discovering more species. From deep within the forests to major urban centres, some 29 million people live in Congo River Basin, where they are divided into more than 250 indigenous groups. 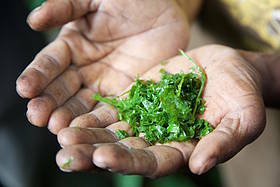 Most people remain heavily dependent on forests for subsistence and raw materials, as a complement to agricultural activities. In 1999, leaders of six Central African countries met in Yaounde with the goal to promote conservation of the Congo Basin.